Egyptian airport officials say an Eritrean detainee of the U.S. Immigration and Customs Enforcement agency has died in a holding area after apparently committing suicide. The officials said on Saturday that Zeresenay Ermias Testfatsion, 34, was being held by authorities at Cairo International Airport, awaiting his return to Asmara, Eritrea. They say he was found deceased on Wednesday in a shower area and that his remains were taken to the nearby Heliopolis Hospital. The officials spoke on condition of anonymity because they were not authorized to brief media. A Saturday statement by ICE confirmed the death, adding that Testfatsion had been in ICE custody since Feb 2, 2017 following his arrest at the Hidalgo, Texas Port of Entry after he attempted to unlawfully enter the United States. Pope Francis told leading oil executives Saturday that the transition to less-polluting energy sources "is a challenge of epochal proportions" and warned that satisfying the world's energy needs "must not destroy civilization." 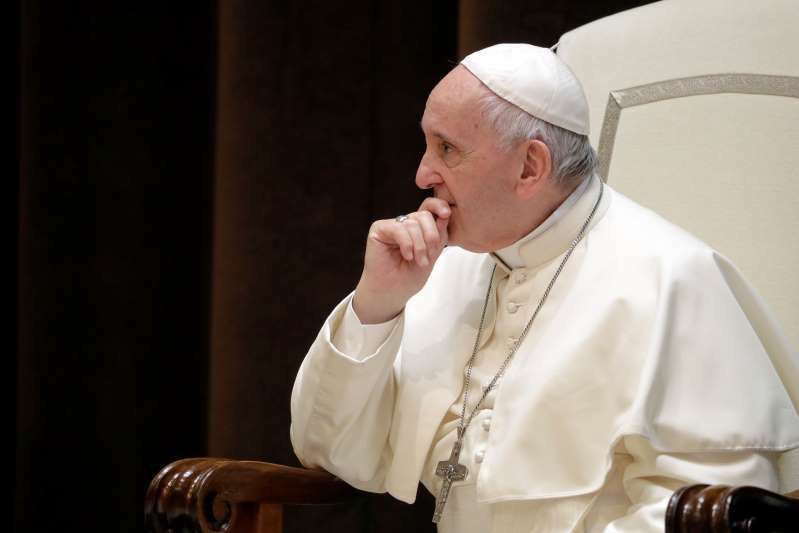 The Vatican said Francis held a two-day conference with the executives as a follow-up to his encyclical three years ago that called on people to save the planet from climate change and other environmental ills. Participants included the CEOs of Italian oil giant ENI, British Petroleum, ExxonMobil and Norway's Statoil as well as scientists and managers of major investment funds. Their remarks on the first day of the closed-door conference were not released by the Vatican. While Francis lauded the oil executives for embedding an assessment of climate change risks into their planning strategies, he also put them on notice for their "continued search for fossil fuel reserves," 2½ years after the Paris climate accord "clearly urged keeping most fossil fuels underground." "Civilization requires energy, but energy must not destroy civilization," he implored. In his remarks, the pope said he hoped the meeting gave participants the chance to "re-examine old assumptions and gain new perspectives." Francis said that modern society with its "massive movement of information, persons and things requires an immense supply of energy." And still, he said, as many as one billion people still lack electricity. The pope said meeting the energy needs of everyone on the planet must be done in ways "that avoid creating environmental imbalances, resulting in deterioration and pollution that is gravely harmful to our human family, both now and in the future." Frances also recalled his own appeal in the "Laudato Si" encyclical for an energy policy "aimed at averting disastrous climate changes that could compromise the well-being and future of the human family, and our common home." That includes transitioning to efficient, clean energy sources. "This is a challenge of epochal proportions," he said Saturday. "At the same time it is an immense opportunity to encourage efforts to ensure fuller access to energy by less developed countries ... as well as diversifying energy sources and promoting the sustainable development of renewable forms of energy." The pope called for a "long-term global strategy to provide energy security," along with "precise commitments" to tackle the challenge of climate change. He said it was "disturbing and a cause for real concern" that the levels of carbon dioxide emissions and the concentrations of greenhouse gases remain high despite commitments taken in the 2015 Paris accord to fight global warming. He urged participants to use their "demonstrated aptitude for innovation" to address "two of the great needs in today's world: the care of the poor and the environment." He noted that the poor pay the highest price for climate change, often being forced to migrate due to water insecurity, severe weather and an accompanying collapse in agriculture. "The transition to accessible and clean energy is a duty that we owe toward millions of our brothers and sisters around the world, poor countries and generations yet to come," the pope said.